Global Supply Line are sole Parveen agents Australia, New Zealand and Papua New Guinea. Parveen manufacture a diverse range of oilfield products including:- wellheads, chokes, valves, hammer unions, swivels, studs, ring gaskets, Weco®* style end plug valves, manifolds, down hole production equipment, flanges, fittings, drilling tools, wireline pressure control equipment, gaslift equipment, fishing & milling equipment, B.O.P’s, coil tubing pressure equipment, etc. Global Supply Line have been supplying Parveen products such as swivel unions, hammer unions and valves to the Australian and New Zealand market for 20 years. Parveen hammer unions and swivels are fully interchangeable with FMC®*, Chiksan®* and Weco®* swivels and unions. 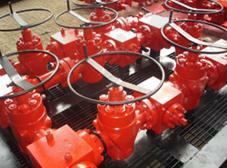 Innovative products and unmatched service has allowed the Company to become an industry leader in oilfield equipment. The Company’s customers include major and independent oil producers all over the world. Through dedicated research and development, Parveen continues to innovate in order to better serve customer needs. The Company has been in operation for over 30 years and is managed and operated by an experienced team of industry experts. Parveen has approximately 500 employees and is headquartered in New Delhi. GSL Adelaide keep Australia’s largest stock holding of Weco® style hammer unions, Chiksan® style swivels and Halliburton®/SPM®/FMC® style Weco® end plug valves up to 15,000 PSI.